When we ingest food to"burn" for fuel, our digestive and metabolic process transformsit into a kind of ash which is either acidic or alkaline. The laws of modern biochemistry further explain that it is not the organic matter of foods (whether the food itself is acidic or alkaline), but their inorganic matter (such as calcium, magnesium, potassium, sodium, sulphur and,phosphorous), that determines either the acidity or alkalinity of this ashy residue. When the nutrients required to maintain this slightly alkaline state cannot be obtained from food, the body has to work extra hard to bring it back into a state that is slightly alkaline. One of the ways this is done is by sapping calcium reserves, as well as other minerals from bone tissue in orderto help buffer this imbalance. This in turn damages the body’s ability to repair itself and detoxify heavy metals, which increases vulnerability to fatigue and illness. Numerous chronic health conditions are being connected to this acid/alkaline balance and while there is still debate as to what the absolute truth is, there are many health professionals that are convinced that this imbalance is associated with a multitude of health problems. One of the simplest and most effective ways in which to ensure that our body’s PH is slightly alkaline is by regularly consuming pressed green juices. Alkalizing ingredients to include are ginger, kale, spinach, Swiss chard, parsley, celery,broccoli, and lemon. 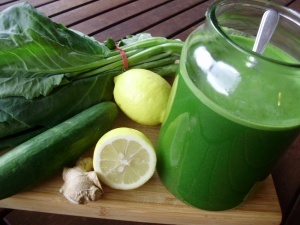 So if you are yearning for sustainable energy, glowing skin and a more positive mood, give green juices a try. They are fresh, clean and delicious, a perfect solution for PH regulation, and a super alternative to sugary foods,coffee and other stimulants.